Twitter gets much of the plaudits in discussions about the transforming nature of social media upon news. It has been spoken and written about ad nauseum and there are plenty of good examples of just how well journalists can navigate their way past Bieber to Benghazi. Yet, I’m becoming increasingly convinced that Facebook is a secret weapon when it comes to social news and social search. The ability to build relationships through groups and to search for location-based updates is undervalued and maybe misunderstood. Journalists should spend more time experimenting with Facebook search. You will be surprised at how quickly you will find results. Using these approaches via your personal Facebook profile throws up obvious problems: privacy, loss of data, potential for spam, etc. It’s likely that journalistic trepidation in clicking that send message button comes not from a desire to avoid intrusion into strangers’ lives but from the journalist’s own fears that they will be intruded upon. Right. 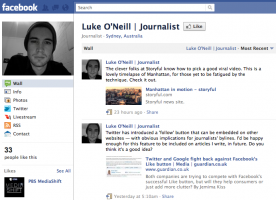 So why have I set up a journalist’s Facebook page? It’s partly — I admit — to avoid the concerns I mention earlier, and also to ring-fence my news musing and pontification from disinterested Facebook friends. My primary school friends don’t care much that Dorothy Parvaz was detained or that she has been set free. Mainly, I have set it up as a potential resource for myself and others. I’m sure there are many journalists like me who are still finding their way amid the social media muddle. The presence of self-appointed “social media experts” on Twitter may dissuade newcomers from taking their first steps. I would particularly welcome input and debate from young and student journalists on my Facebook page. I am no expert. You should beware of those who say they are: it suggests an end to learning, something we should all avoid. For news users: I hope at some point to provide exclusive content and to engage with the people who are so kind to “like” the page. Aggregation and link-out policies (Again, keen to hear others approach this). I would welcome my media friends, colleagues, and peers to join me here to kick things off.